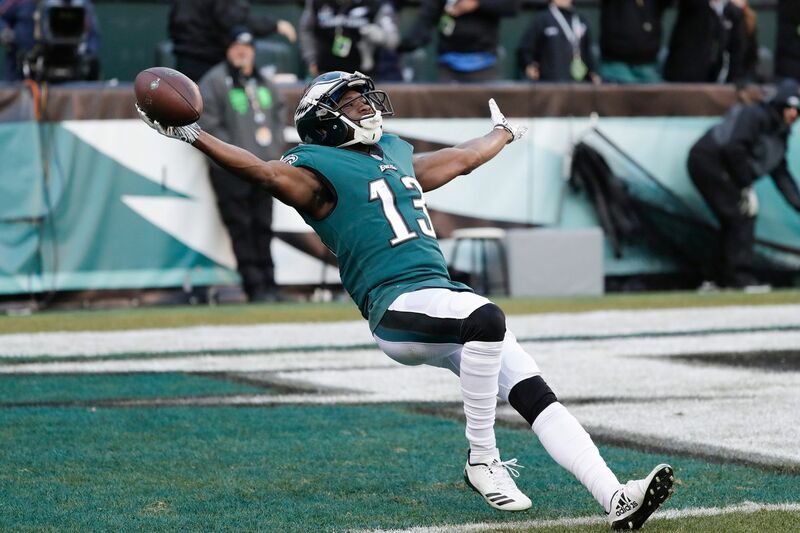 Nelson Agholor falls back into the end zone after scoring in the third quarter. The Eagles beat the Texans in a must-win Week 16 matchup. How did the defending Super Bowl champs play? Paul Domowitch offers up his grades in six areas. Read his analysis then tell us what you thought. Let’s see. There was Darren Sproles’ 16-yard second-and-10 run on the Eagles’ game-winning scoring drive. Aside from that, their only other notable run play might’ve been a successful third-quarter sneak by Nick Foles. The Eagles averaged just 2.3 yards per carry and Josh Adams had a costly fourth-quarter fumble that resuscitated the Texans. Ol’ St. Nick turned in a magical performance that allowed the Eagles to live to fight at least one more day. He threw for four touchdowns and a franchise-record 471 yards. He got up off the carpet in the fourth quarter after absorbing a vicious blow from the Texans’ Jadeveon Clowney and got the Eagles close enough for a game-winning field goal. He completed 12 of 13 third-down passes, including six to tight end Zach Ertz. Ertz, Alshon Jeffery, Nelson Agholor and Darren Sproles combined for 384 receiving yards and four TDs. The Texans were missing their top running back, Lamar Miller, which definitely helped. But the Eagles did an excellent job of neutralizing their other two backs, Alfred Blue and D’Onta Foreman, holding them to 13 yards on 11 carries. The guy that gave them the most problems was their elusive quarterback, Deshaun Watson, who rushed for 49 yards and two touchdowns on eight carries. The Eagles did a good job against Watson and the Texans’ passing game in the first half but in the second half, not so much. Watson completed 19-of-26 passes in the second half, averaging 9 yards per attempt and throwing two touchdowns. But the Eagles’ pass rush sacked him three times in the fourth quarter, including a huge third-down strip sack by Chris Long that led to the Eagles’ final touchdown. Jake Elliott missed his second PAT of the season early in the fourth quarter, but more than made up for it at the end with a game-winning 35-yard field goal. A poor kickoff return by Boston Scott forced the Eagles to start their game-winning drive at their 11-yard time. The kickoff coverage unit, which was so good last week, gave up a pair of 29- and 30-yard returns to Houston. But Elliott’s field goal trumped everything else. Three turnovers. Several stupid penalties that shouldn’t happen in a must-win Week 16 game. Another fourth-quarter collapse by the defense. Yet, they won. With their nine-time Pro Bowl left tackle Jason Peters playing just a few snaps before leaving with a quad injury, they won. With their ground game averaging just 2.3 yards per carry, they won.